The great Oscar Robertson belongs to several Hall of Fames. He's been inducted twice into the Naismith Memorial Basketball Hall of Fame, once as an individual college and pro superstar in 1980 and again as a member of the 1960 U.S. Olympic basketball gold medal team in 2010. 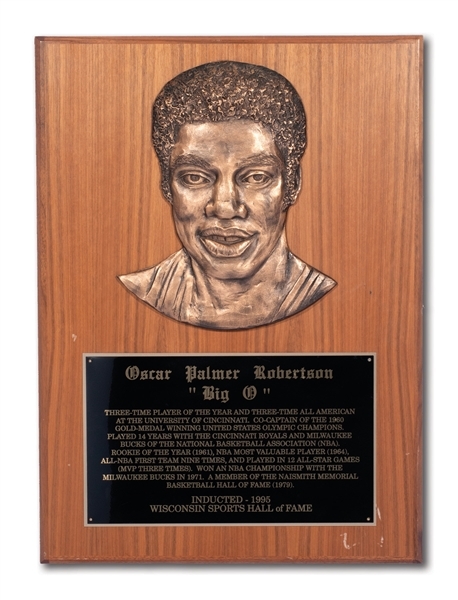 The National High School Sports Hall of Fame (1983), Indiana High School Hall of Fame (1982), and College Basketball Hall of Fame (2006) have also enshrined The Big O for his scholastic and amateur accomplishments. In 1995, to honor his four successful NBA seasons with the Milwaukee Bucks that brought home the frachnise's only world championship, Robertson was inducted into the Wisconsin Sports Hall of Fame and received this impressive award. Measuring 16" by 22" and weighing 13 pounds, the plaque features a bronzed bust of Oscar's face on a 3/4" thick wood backing below which is a placard highlighting several of the countless awards and accolades from Robertson's storied career. The artistic rendition of Oscar's hair and facial features is fairly accurate to his look while running the point for Milwaukee in the early 70's. The piece shows little handling and comes essecntially as-issued in outstanding condition, ready for wall display just as The Big O had it up for years in his home. Includes LOA from Oscar Robertson.